Central Board of Secondary Education (CBSE) has registered an FIR against the publisher in the 12th class for teaching women’s figure in the book of Physical Education. Significantly, it has been written in this book that the females whose figure is 36-24-36 are the best. The book describes the fitness standards of men and women, It describes what is the difference between the physical size of a man and woman. The Central Board of Secondary Education (CBSE) said in a statement, “Schools are expected to take utmost care when choosing a book of a private publisher, and the material must be checked so that any objectionable thing can be removed from which any Emotions of class, community, gender, religious group are hurt. Schools will have to take responsibility for the contents of the books themselves. This book of class 12 is written by Doctor VK Sharma. It has been published by New Saraswati House, Delhi, with the title “Health and Physical Education”. This book is taught in the curriculum of Physical Education in various schools affiliated to Central Board of Secondary Education (CBSE). CBSE, however, clarified that she has not recommended any book of private publishers in her schools. 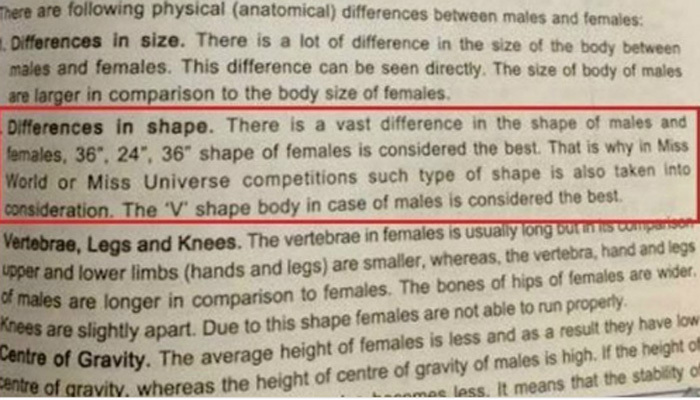 “36-24-36 size of women is considered to be the best,” said in a part of the book’s text “Physiology and Sports”. This is the reason why such a body size is also taken care of in Miss World or Miss Universe competitions. This part of the book on social media is becoming viral. Various users on Twitter mentioned this excerpt by sharing pictures and demanding that the publisher withdraw this material and remove this book from school curriculum.